#1984380 - 08/26/08 12:08 PM Wall boundary trapping. My first post here, but have been viewing and digesting information from here for nearly a year now. Thanks due to Ethan for such input and allowing so much free information. 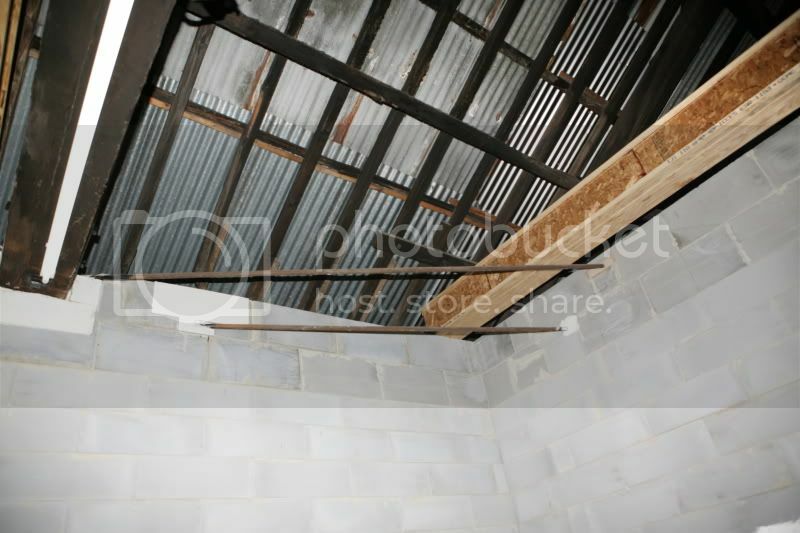 On top of this will go the ceiling joists which are 300mm (12") wooden I beams. 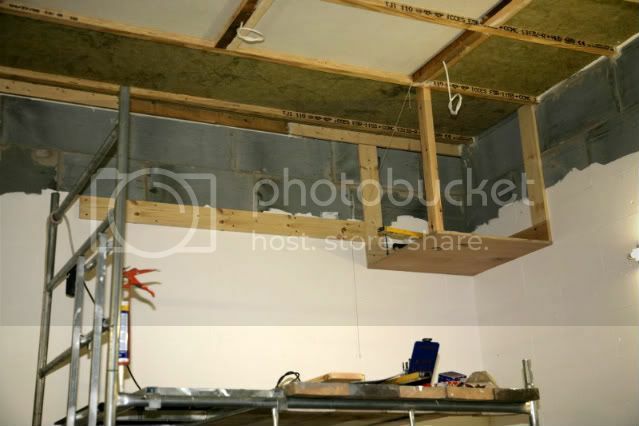 I still have the option to have a prety much 'open' ceiling by putting insulation between the joists and then covering with whatever I want to - so I can bass trap, low and high trap the entire ceiling if so required. 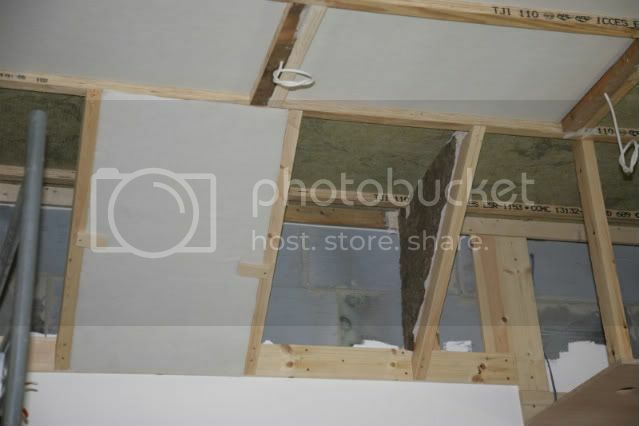 My two questions for now are - Supposing I do plasterboard (sheetrock) the ceiling, where the wall meets the ceiling I am going to put trapping all the way round the room - using 4" rockwool which will also be the same as in all 4 vertical corners. 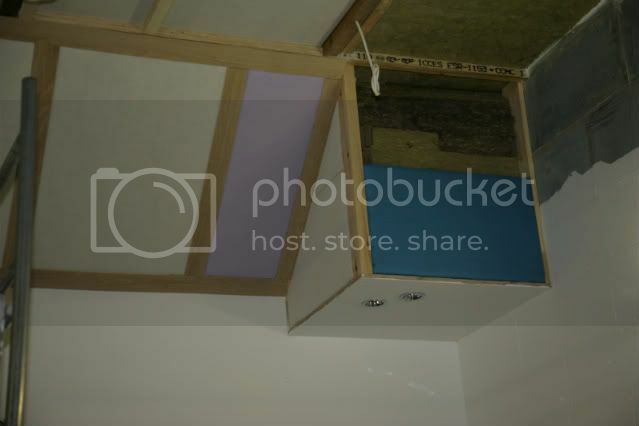 Should I leave this part of the ceiling uncovered with sheetrock or not - this would allow sound to travel further up into the ceiling between the joists? 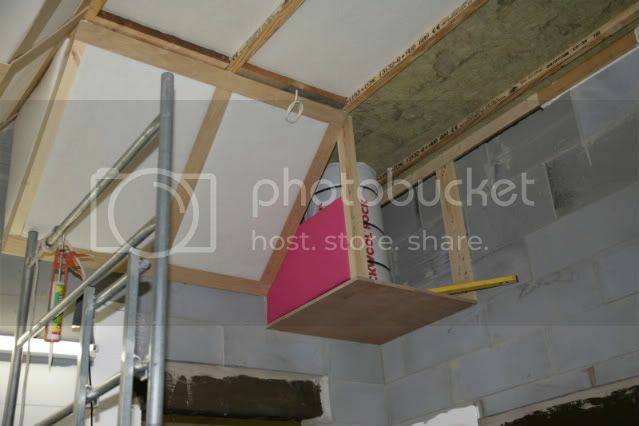 Please note, the joists and upper floor (22mm chipboard) will be completely sealed and as airtight as possible to stop flanking noise to the rest of the building. 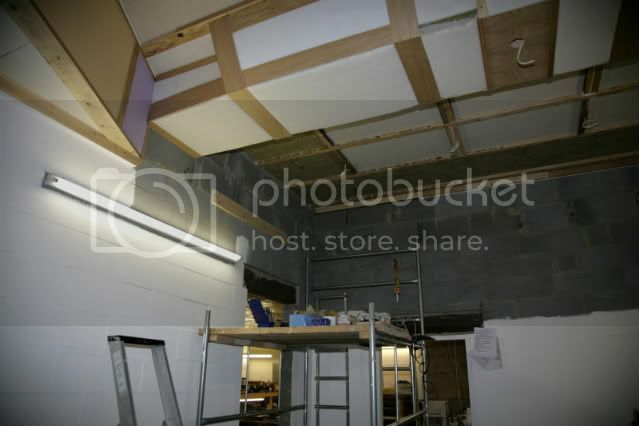 All voids will also be stuffed with 'fluffy' fibreglass as well. 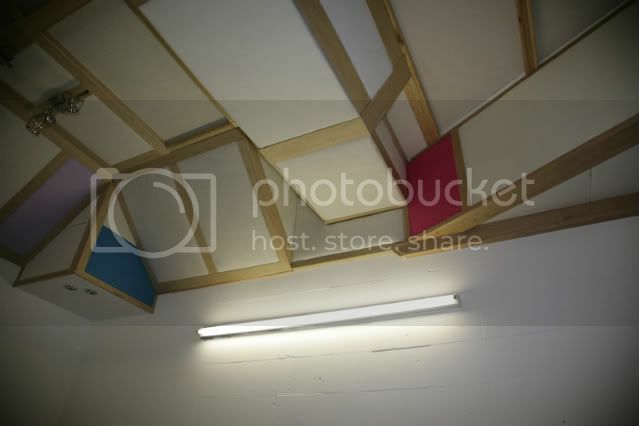 The entire ceiling - what are your thoughts on prety much turning the entire thing into various traps? Would it be worthwhile or just wasting money? 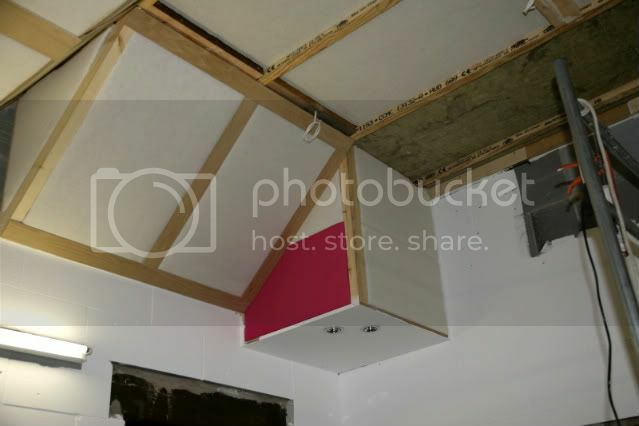 What would be your purpose in putting plaster board on the ceiling at all? 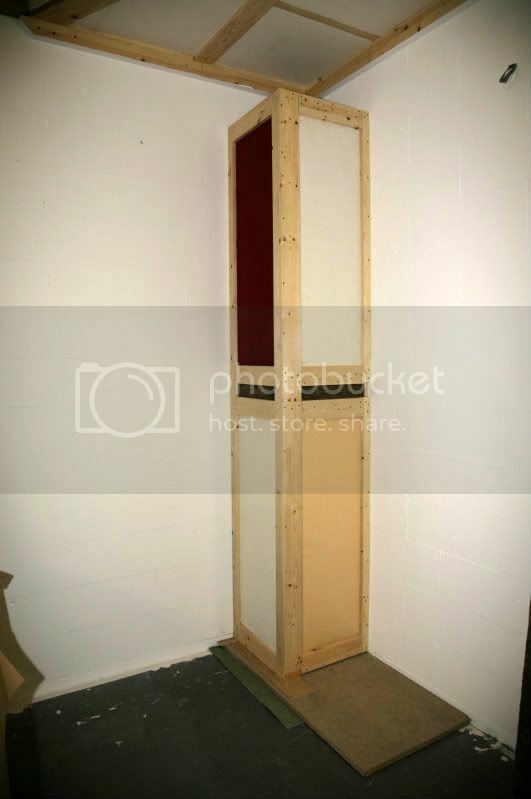 If you don't need it for sound isolation or heat insulation, I wouldn't even bother. 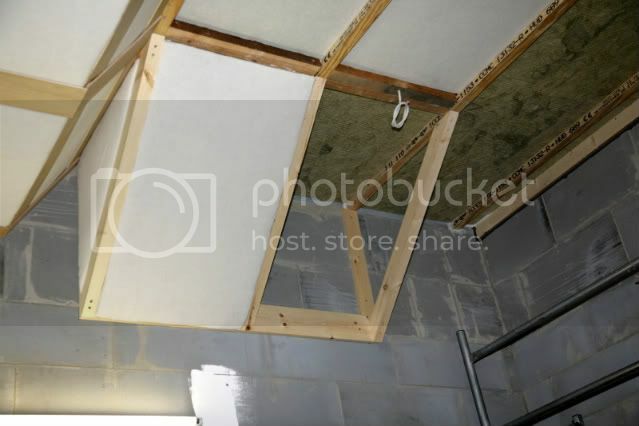 Just put insulation between all the joists and cover with fabric or whatever. 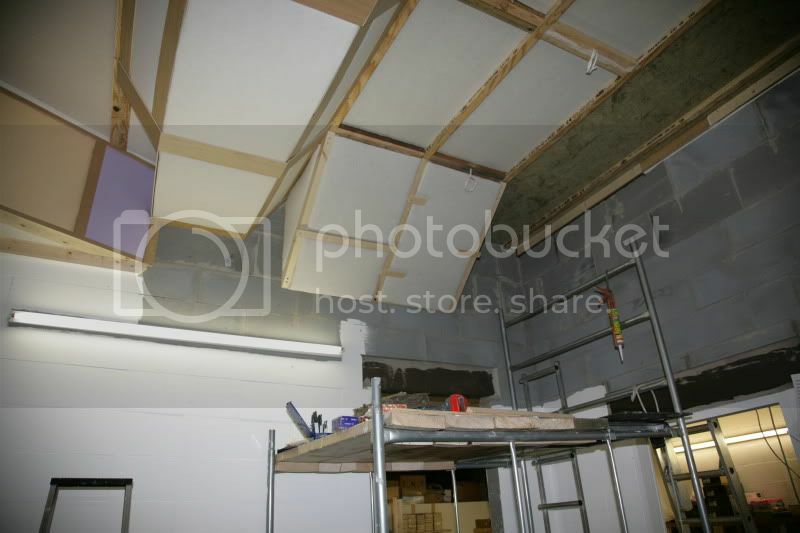 And if you do need sound isolation, leaving off plaster board around the perimeter will compromise the isolation. 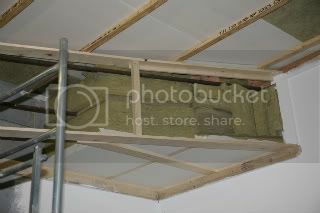 Thanks for that - my 'in best Baldrik voice' cunning plan was to place the plasterboard up between the joists to form traps of various sorts, and as you suggest, cover the entire ceiling with fabric of some sort, I was just uncertain as to if it would actually provide 'to much' trapping as a whole. Looking forward to finally hear what it sounds like in the end. 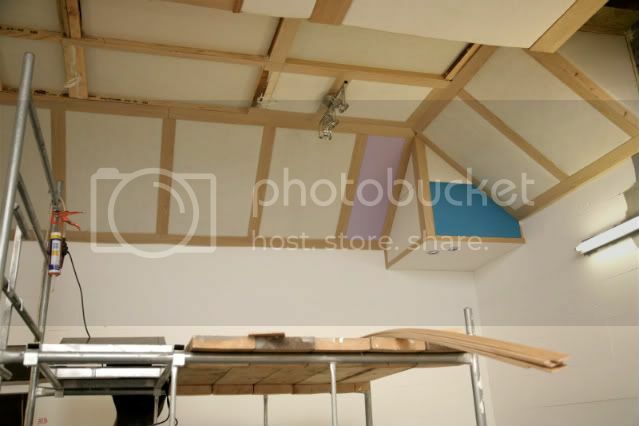 Adding a question to a question here, if all the walls are going to be trapped to prevent standing waves, early reflection, etc., would the ceiling be a candidate for deflection/diffusion in order to utilize otherwise wasted sound to fill the room more evenly? I'm in a similar situation. I'm not an acoustic engineer, but I play one on the internet. Diffusion on a ceiling makes sense 1) if the ceiling is high, and 2) not at loudspeaker reflection points. Thanks, that'll contribute greatly to my planning phase. 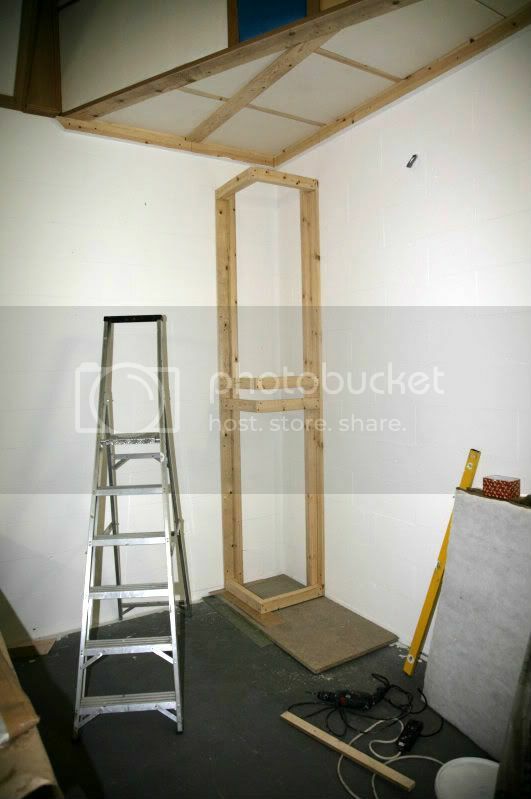 Could you please quantify "high"; is 8 foot too short to benefit? 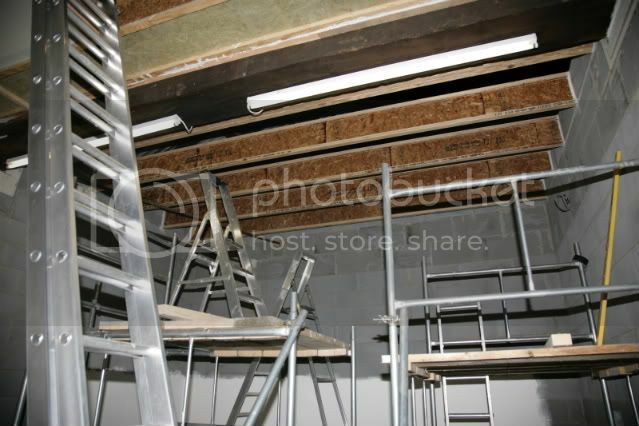 I've got an awfull lot of traps to be building over the next three weeks by the look of it then <wry smile> damn my 12'! Does the fact that I'm a really short guy figure into this? Thanks for the advice so far - it is much appreciated. 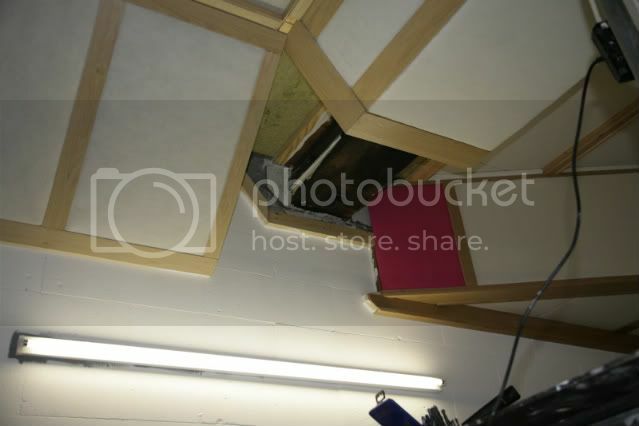 The building of the traps and the incorporation of many of them into the ceiling is due to start in the next week or so. 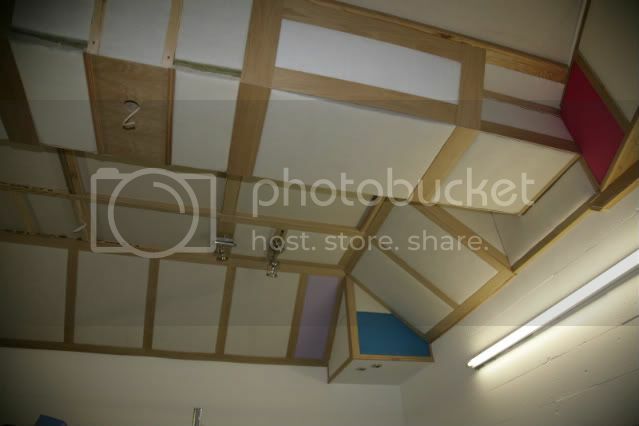 They also have to order and have offered to get for me panels that are 200 Kg per M^3 (!) as I said the more mass the better... 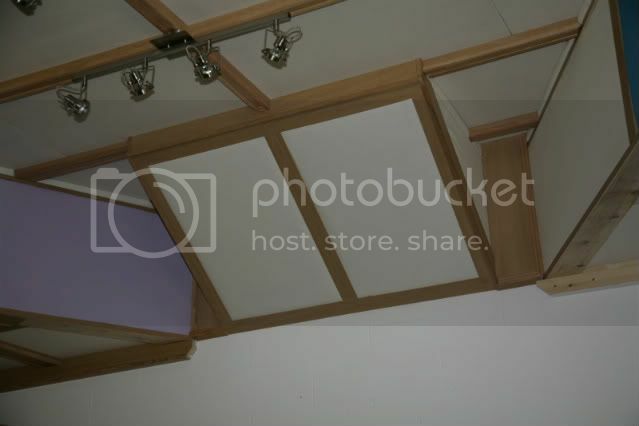 I have thought these may prove to be rather usefull for the front corners and front ceiling / wall interface? Is this too heavy though? 4" of this is going to be the equivalent of an awful lot of the '703'! 200 kg/m3 is very dense. I've never tried anything that dense so I can't say for sure. It's probably okay though. Well it started some weeks ago - fairly easy to do, but takes a while. 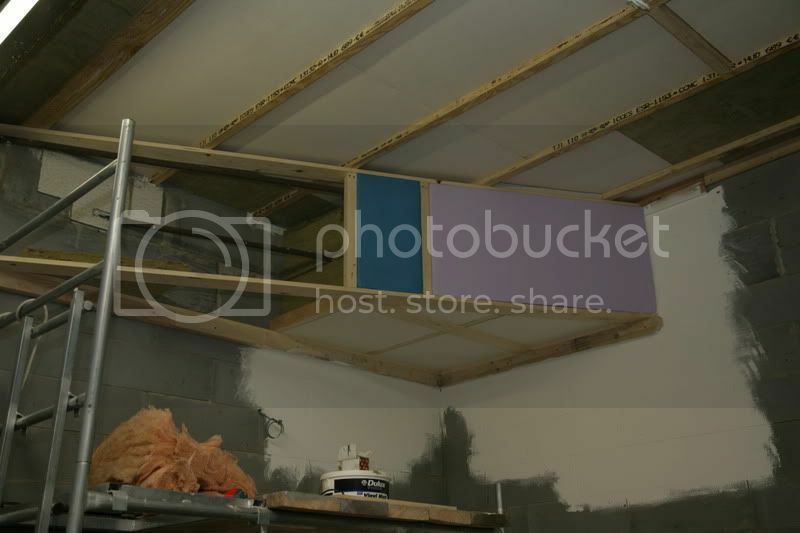 The ceiling is being constructed entirely as a trap ( see photos) with the entire ceiling / wall join being also 100% trapped. 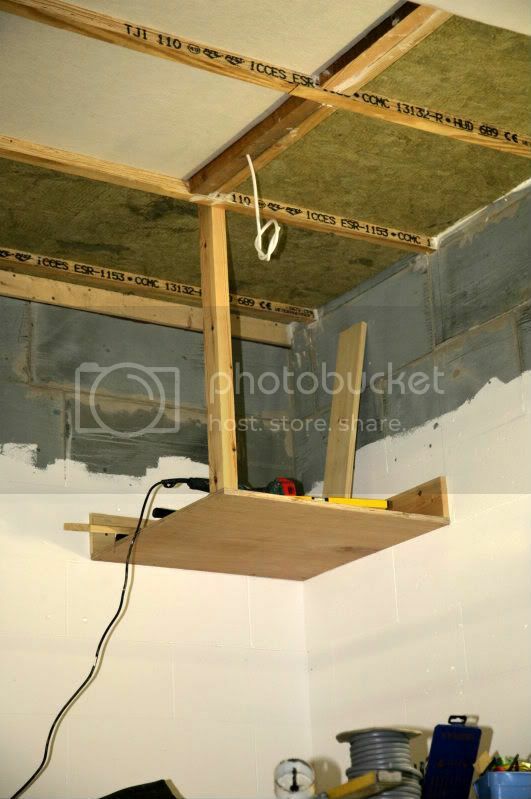 This juction has not been easy to work with as I have some roof truss ties (2" thick steel bars) which are very much in the way at the front of the room - but this has hopefully been overcome with a very large trap - photos of that when its done. 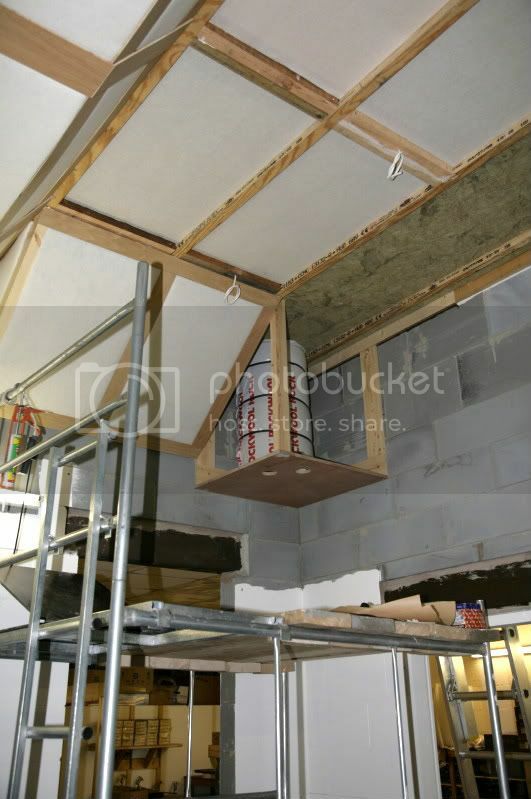 The ceiling is made of engineered 'I' beams, 12" high, so th 4" rockwool sits between these, and each cell is completely sealed. 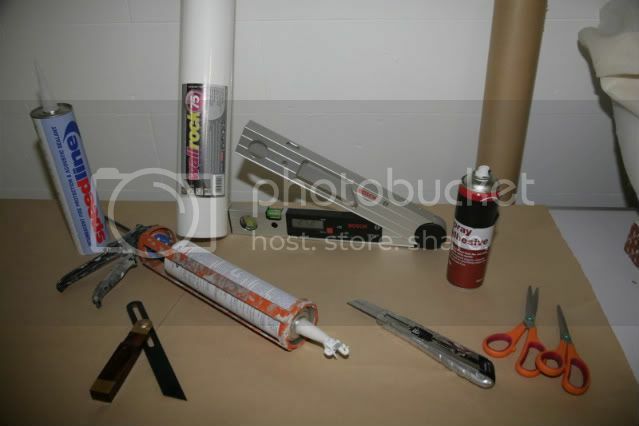 Yes, I have used a LOT of caulk doing this job (100 tubes & counting)but I want it to completely correct to start with - I cant afford to go back and rectify problems later. 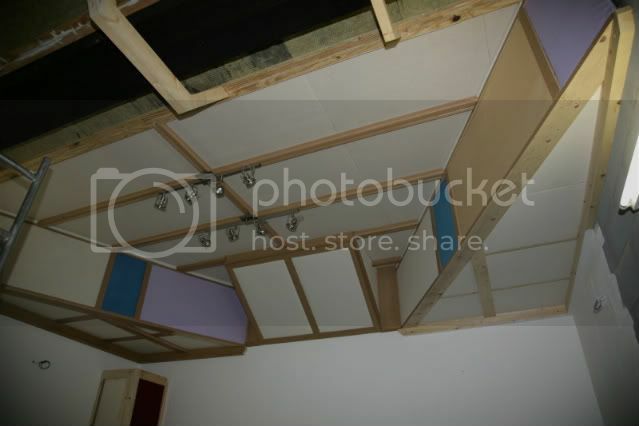 Most of the panels are made to reflect highs with Kraft paper stuck to the facing of the slabs - with this much trapping I figured I could kill the room rather easily, and as it is intended to be a nice office / listening room, dead is not what I wanted. Well its been a while so I thought I'd post a quick up-date and a few pics. With a holiday over the christmas season, followed by a week at CES in Vegas, then a bout of (very bad!) man flu - progress has been painfully slow on this project. 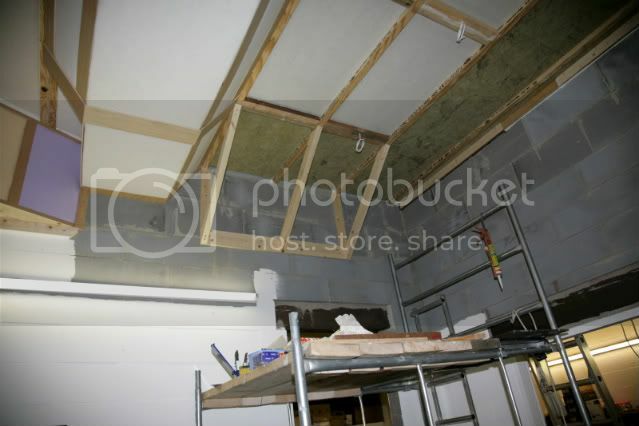 At last the ceiling was finished and fully sealed off. 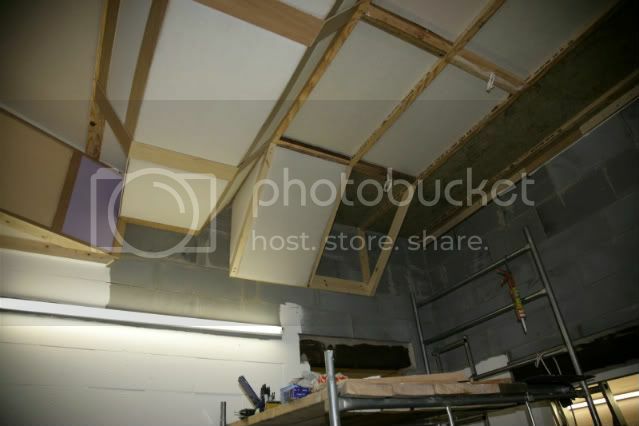 Boy did the last bit going in make a difference to the sound of the room! 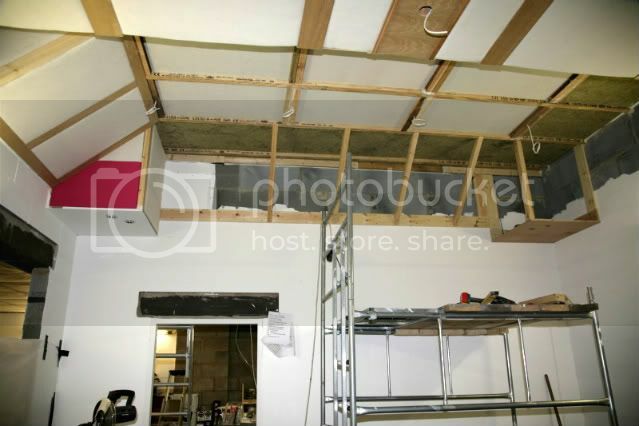 All of the exposed white timber will be clad in natural oak over the next week or so..
Then the framing out to get rid of those pesky building ties once and for all began. 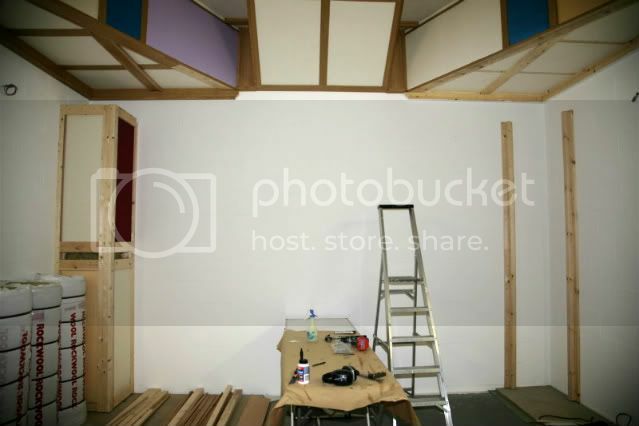 This will of course be 'mirrored' on the opposite wall to keep symetry. 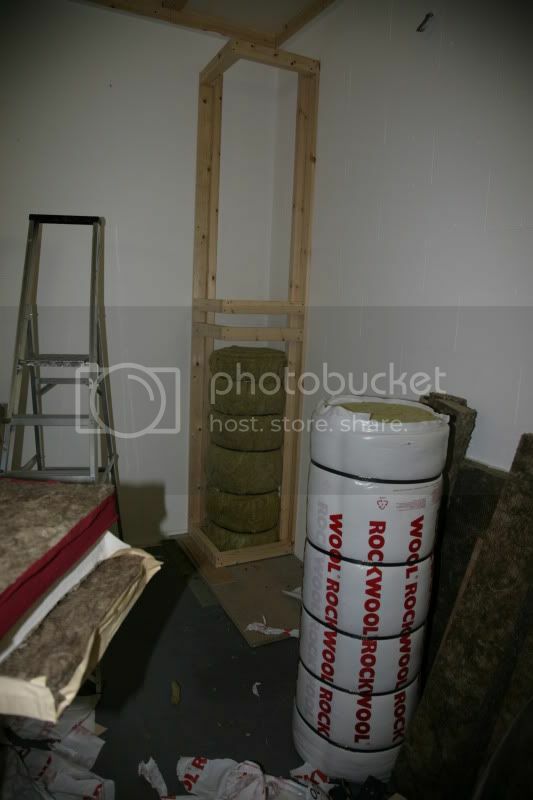 Then the filling with rockwool begins - this is going to be a fairly serious bass trap - 2.5 cubic metres (per side) of rockwool had better have an effect! More to come, but I feel the home straight is now in sight. 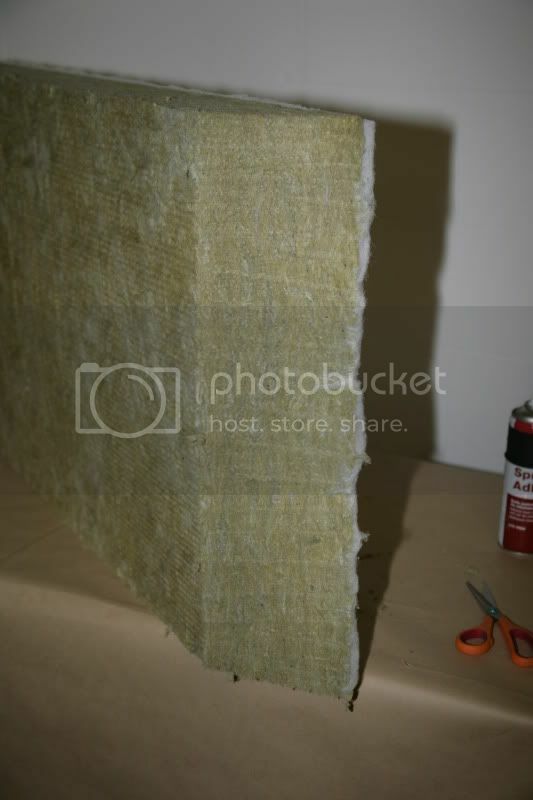 As another quick note - some on here have struggled to find just what to face the rockwool with instead of the 'frk' that is not available in some places. 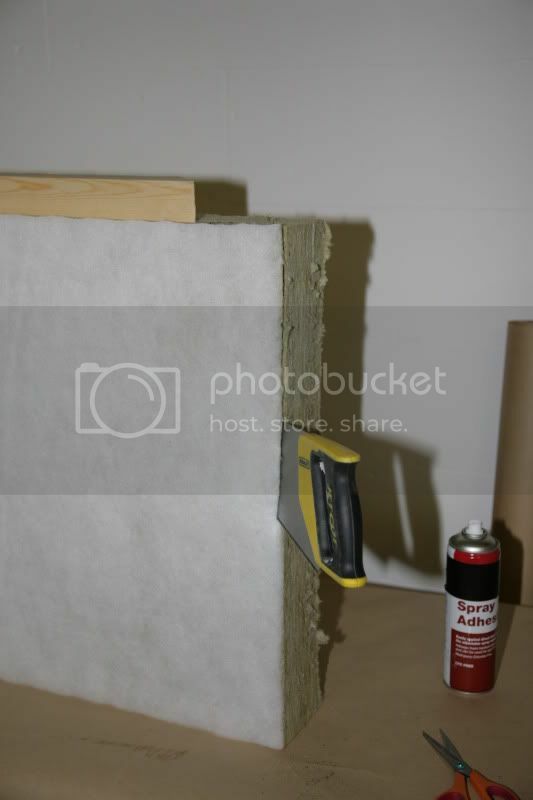 Here in the UK I have used plain rockwool, then covered one of the faces with simple 'Kraft Paper' which is fairly easy to obtain from a packaging supplier. This is fine for most instances, but when 'bright' fabric was to used as the outer a white facing was needed. Much head scratching ensued as white 'Kraft' is not generally available and would be a special order from a paper mill - ouch time on the wallet. A very, very simple solution came to mind. 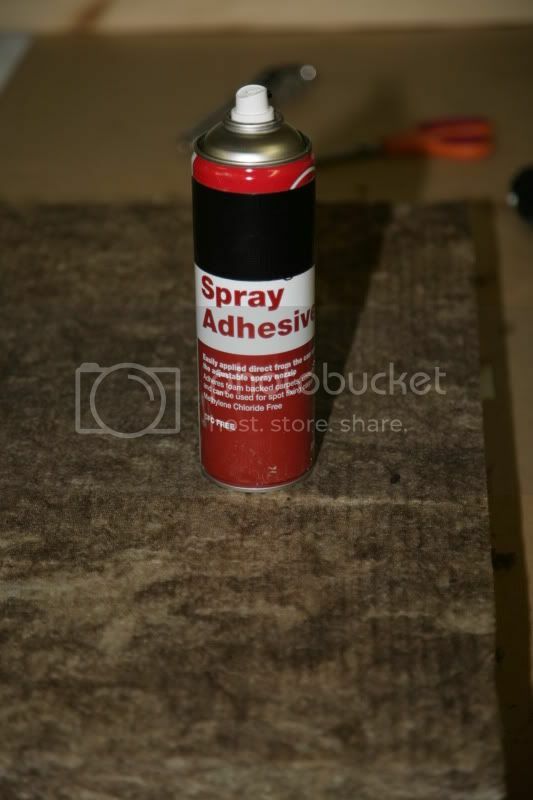 I went to my local decorating wholesaler and asked for some thick lining paper. Perfect! 750mm wide, 20m long roll, and the thickness of thin card - and very white! 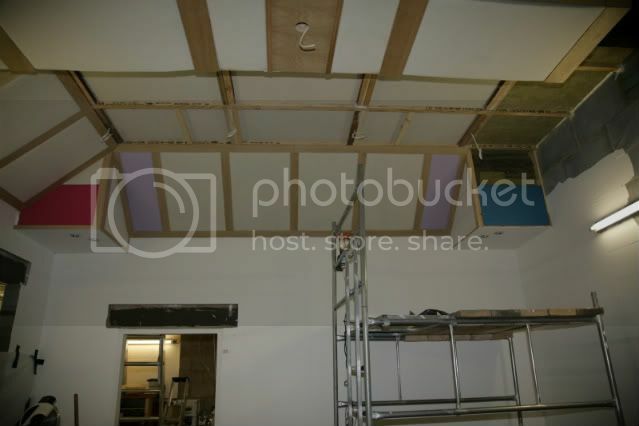 This is what is behind the coloured panels in the photos to provide reflection of mid/high frequencies. Hope this is of use to you guys - should this go into the source for local suppliers? Happy to do so if you think helpfull. Yes, almost any heavy paper or card stock will work fine. Seems to have taken an absolute age - a snail could have worked faster - but illness and available time have had an unfair advantage. 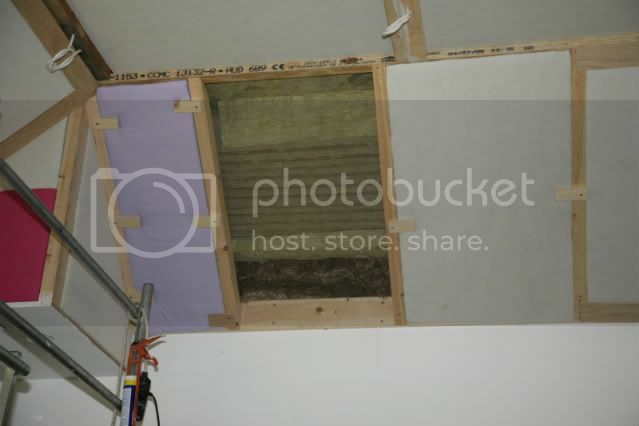 Anyways, I seem to be keeping Knauff insulation in business at the moment, as every trap you see here is filled solid with 705 or at least it's equivalent, & trust me, that is a lot of rockwool. 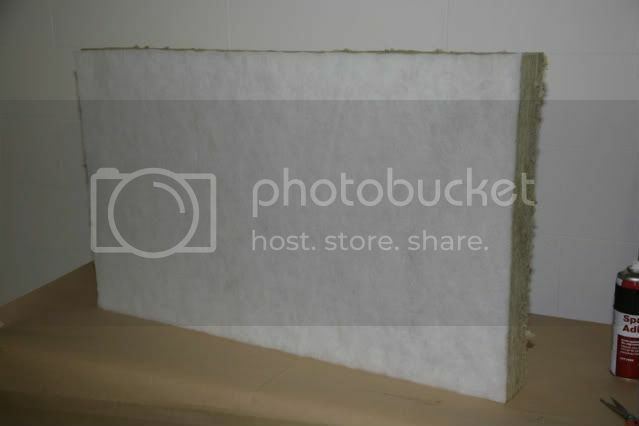 Had a bit of fortune in finding my stockist having a stock clearout and about to put a load of rockwool into a skip (it never made it to the skip..) and also a recent initiative by the government to get more folk buying insulation saw standard rolls of insulation fibreglass going for £3.50 per 1.2m high roll. In it's wrapped / compressed form this was very close to 705 so some 20 rolls were purchased for a bargain price. 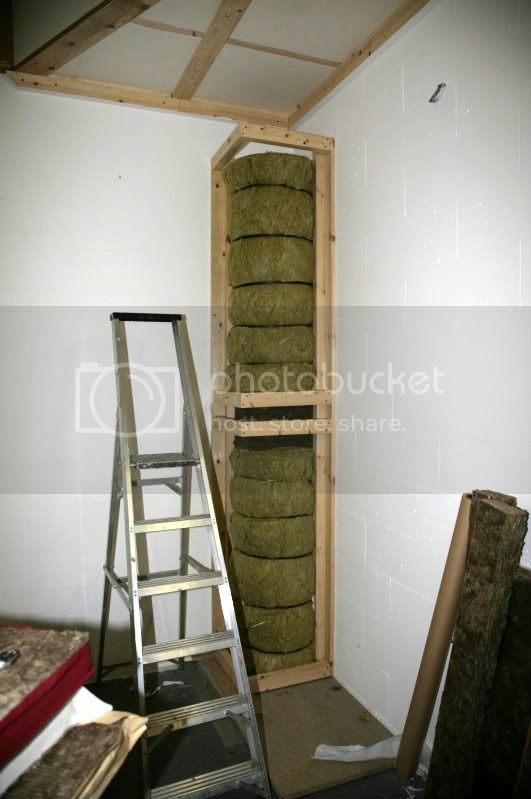 The fun part was keeping it compressed by using our box strapping machine to put straps up each roll every 12" or so. Then getting all the plastic wrapping off without dislodging the wraps. 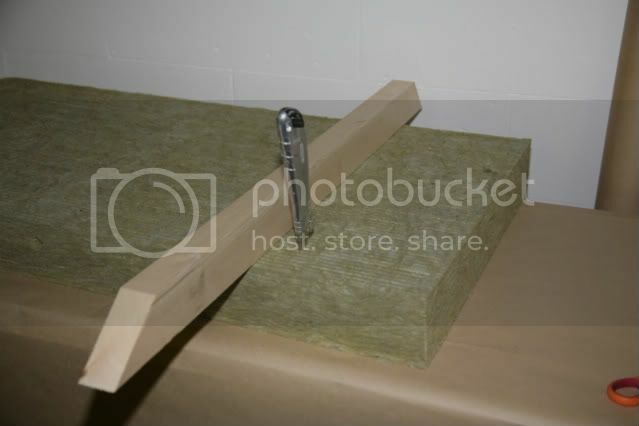 This did produce rolls that vary slightly in desity from less to more from the outside > in as it does expand slighty when the wrapping is removed - these have been used to fill some of the traps. Photos of these will follow as the cameras batteries died. 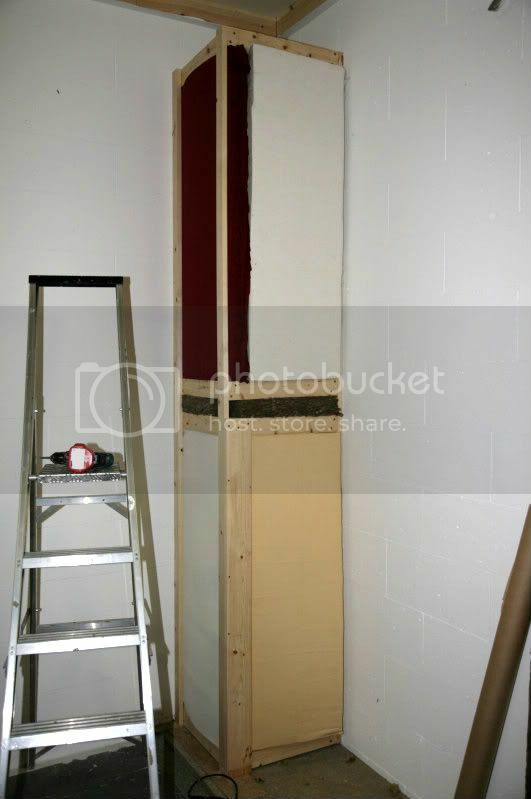 is 1.2m square and is at 35 degrees to the wall. 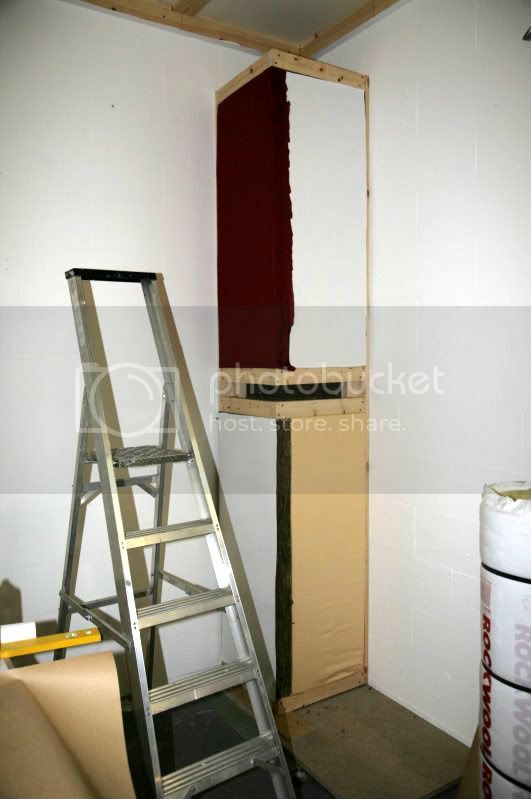 Faced with cotton cloth over thin card, and the base is still 11' from the floor - which should give some idea to scale. 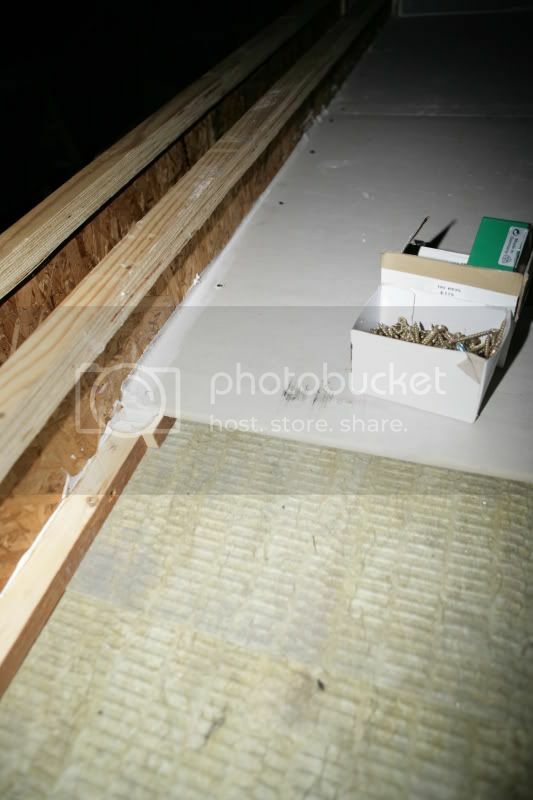 The terrible roof ties are now truly hidden for ever, and the final bugbear of the thick beam is now finally being covered. 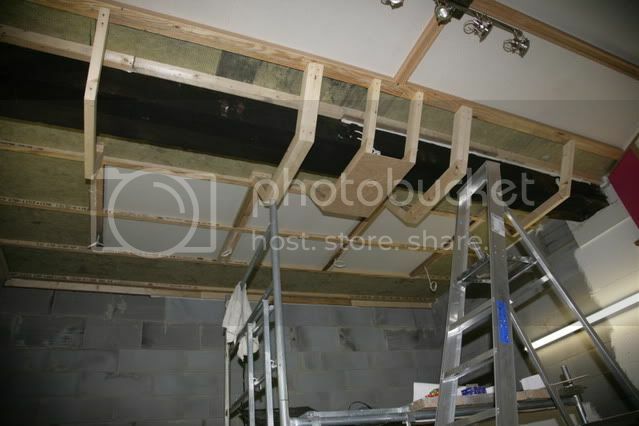 This is not an easy task, and would have been better if it didnt need doing - but knowing just how bad a big beam running across a listening room can be, decided it had to go. One question still sticks in my mind. I have done this from the very begining, and have no idea just what difference (if any) all these traps have made on the room. Part of me realy wants to know how the room will measure when finally finished from the listening chair - but that would mean the purchase of a mic - (phantom power? -whats all that about!) pc programs and a heap of other stuff - would I be better off just knowing it will sound better than built without any traps? Still that part of me wants some sort of a 'measured' answer I guess! This article explains how I use ETF, but the principles apply to all such programs. Well I guess the inquisitive side of me will win out in the end & I will be buying that stuff - I'll try & make a list later & you can let me know if it's complete or not. The software looks easy enough for me to master - we will see! 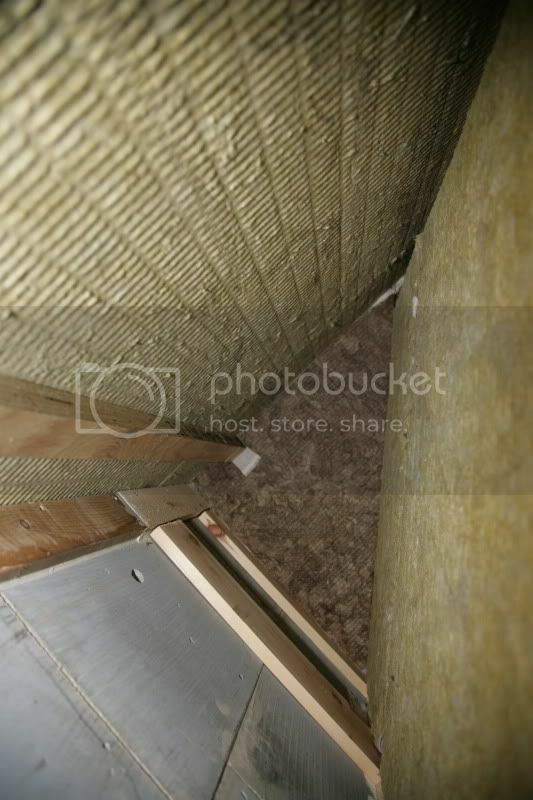 Oh joy - more unwrapping of rockwool - truly not a fun task. Needed to be done as the front pannels are all lined with paper. Worked out what happened there - there is a max number of links per post and the above reached the limit - the rest are now below..
Well I dont know whats happened there - I guess I ran outa room? The rear corner trap will be fun (as is now nearly done, but more pics (if you want to see?) can follow. This room had better sound good..
No pics this time as I left the camera at work & I've had a bottle of wine with dinner - so they can wait a while. Back wall is now framed out, two top corner traps built and lights are fitted inside them. 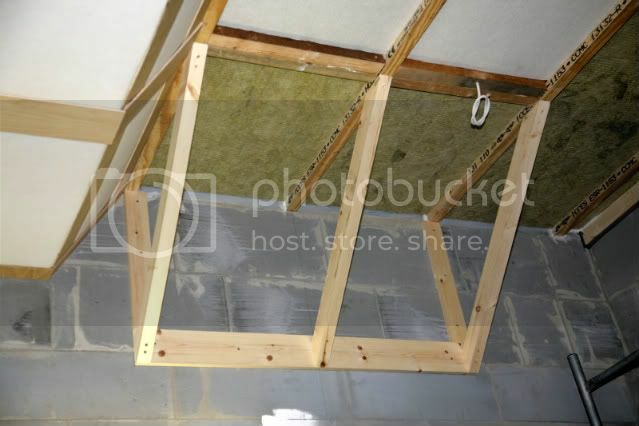 4 more large wall/ceiling traps built with 4" 120kg rockwool to help make the RFZ, so only two more traps to build and i'm done at ceiling height. That then leaves first reflection points and the walls. 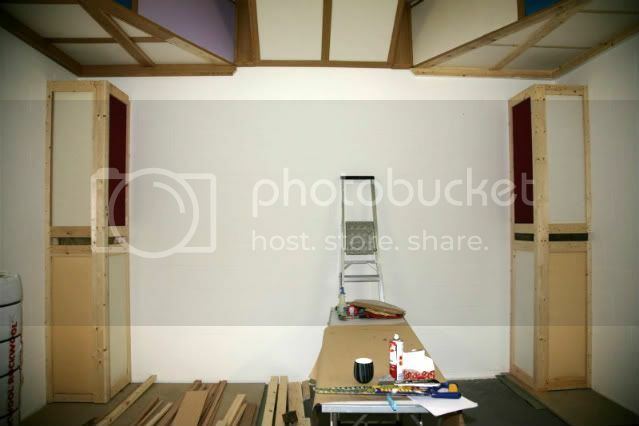 Oh -and some wiring in of sockets and desk building. Computer + one of the suggested programs. What is the 'Phantom power' supply i've been reading about for a mic - is one needed? I 'think' that is what I need? I have read the links several times now so I hope to get a hang of it quickly. 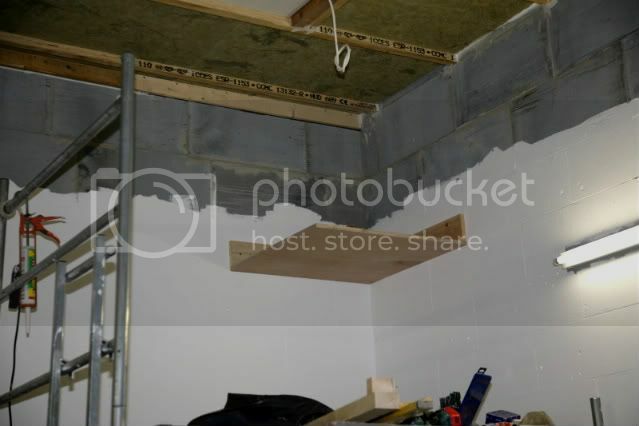 Yet more hands on learning to be had I guess, I wont permanently fix the wall traps till measurements are taken to see the best placement - as I'm going to the expense of getting this stuff! PS - fibreglass rash/itch is now taking its toll on my arms and face, no matter about gloves and respirator - fun or what. The room is looking good though - and I just ordered my speakers to go in it, so it now has to be done as a matter of urgency. 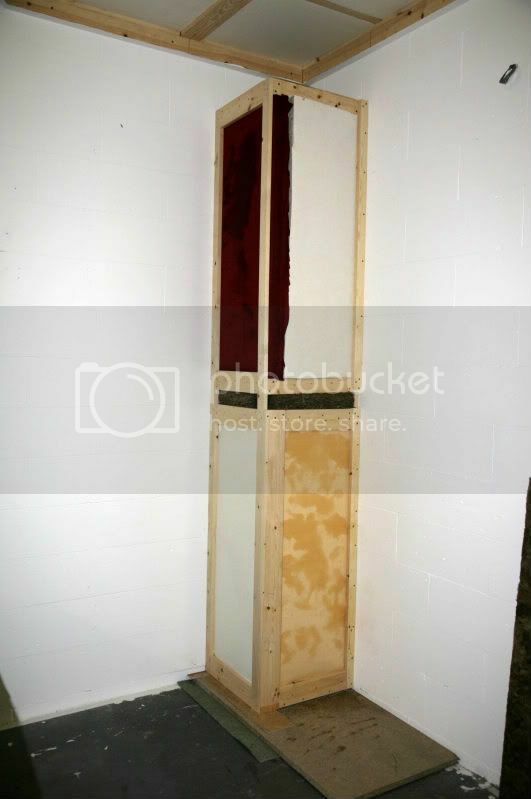 Rear R/H corner trap built, wired with two lights, and filled with 705, then faced with more fabric covered 705. One more piece to screw in then the rockwoll can start to go in. I'm certain it allcomes from the same place (3M?) but the price varies greatly! This is something like tin number 45! Having said that there is rather a lot of 'traps' in this room now. Yes, I am aware that the two rear corner traps have effectively now created another two areas that need trapping below them, but the plans are already in place for what to do there - just needs to be slightly later for now. Another few evenings work and we have a lot more done. Another panel takes shape. Cut to size, faced with polyester to hide the colour, and then mitred to fit. 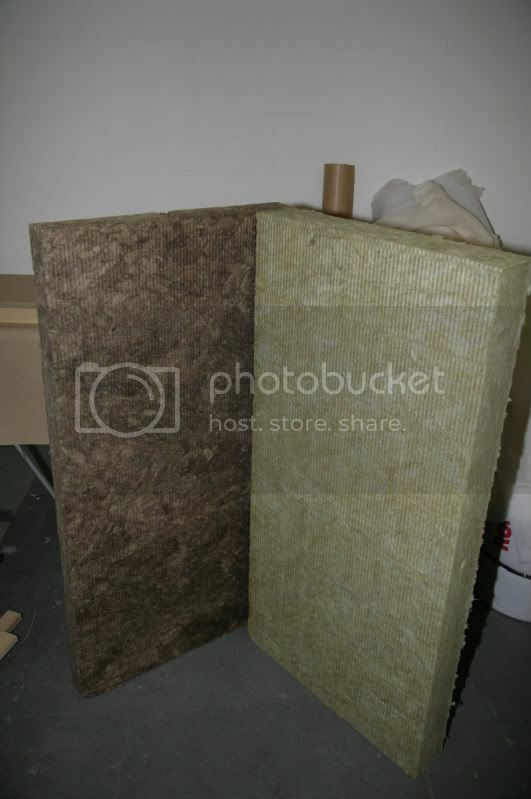 Rockwool mysteriously changes colour in the UK? Yup, gone is the usual yellow green to be replaced by 'burnt straw' Why - your guess is as good as mine. Definately needs covering though as it shows through most material badly. A few tools that have proven indespensible. 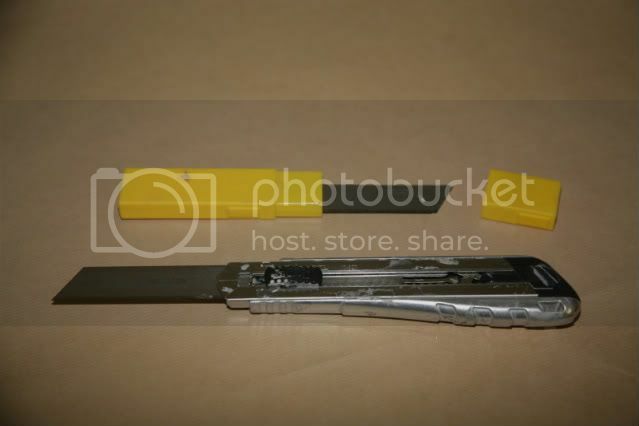 And best of all - the Stanley 'Fatmax' knife - with 'insulation' blade. 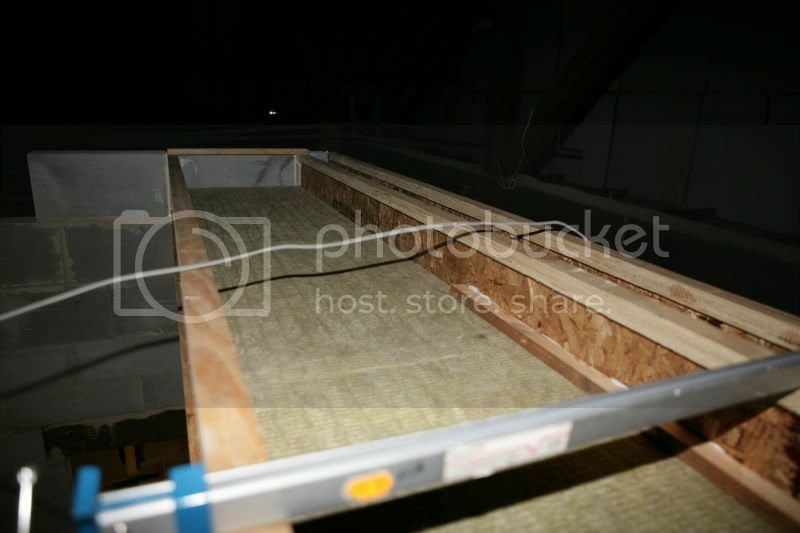 Hopefully the last thing a pesky bouncing soundwave sees before deciding that the great soundscape in the sky sounds like a good place to be - the inside of a trap before stuffing with yet more rockwool. another 5 metres of traps completed. 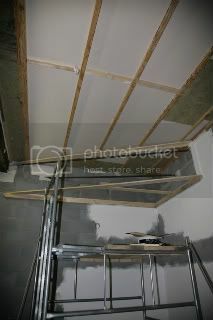 so Easter should provide a perfect time to completey finish all the ceiling / wall boundaries. Easy to press on when the phone doesn't keep ringing and pulling you away from the job in hand. 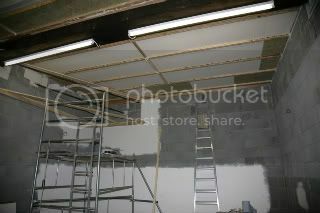 Then time to start on the final bit - that pesky beam is about to disapear for good - hopefully. The beam has a total of (roughly) 10 traps on it. & finishing it all off nicely takes an absolute age - but well worth the effort. 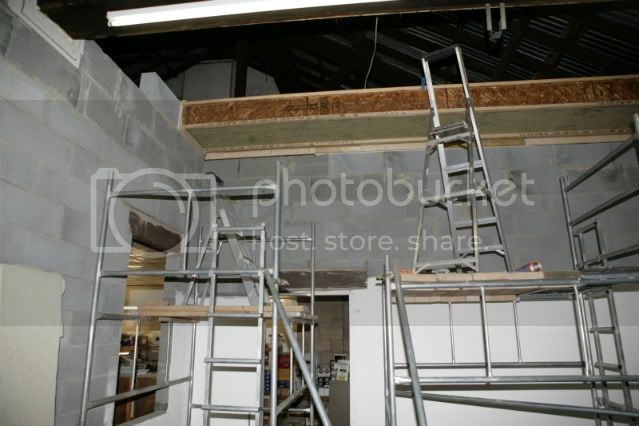 A little more blinding of the wooden I beams with oak, a few more lights to go up and tat particular phase is completed. That just leaves the walls to be sorted. Hopefully some neat ideas for that shortly. I'm happy that this part is now done, and the project appears to be nearing completion. I am about to start on some traps for the 'back wall' which will be behind the listening position and also some for the first reflection points along the side walls. 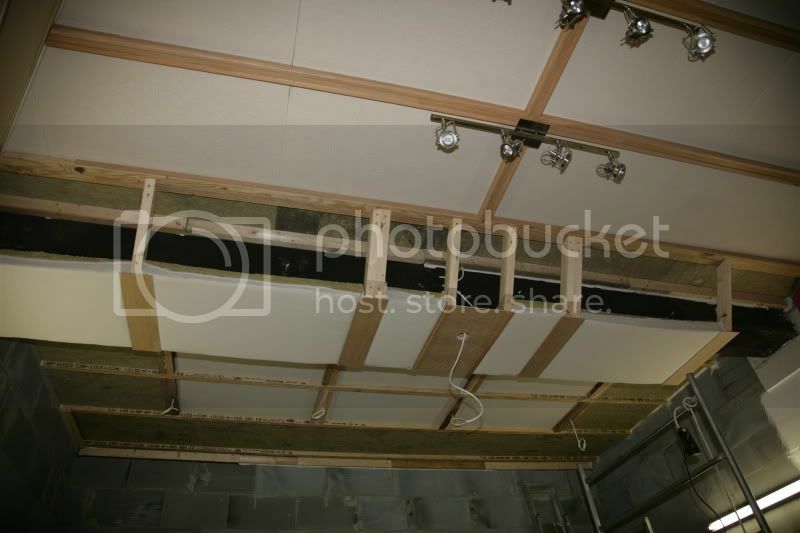 From a post some time ago I have some plans that put the low bass wood fronted absorber inside a heavy duty mid/high absorber - this makes for a fairly thick panel but I have the room. 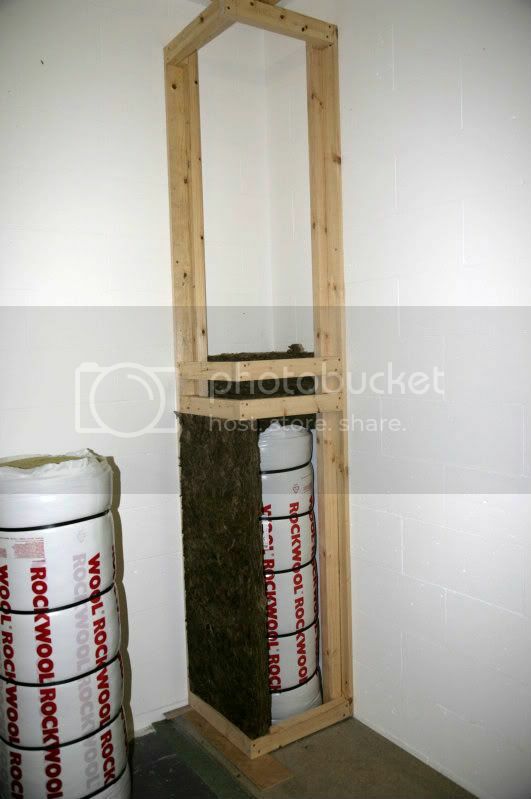 Is this a worthwhile option, or should I just stick with the standard 3-4" thick 705 in a trap for these applications? 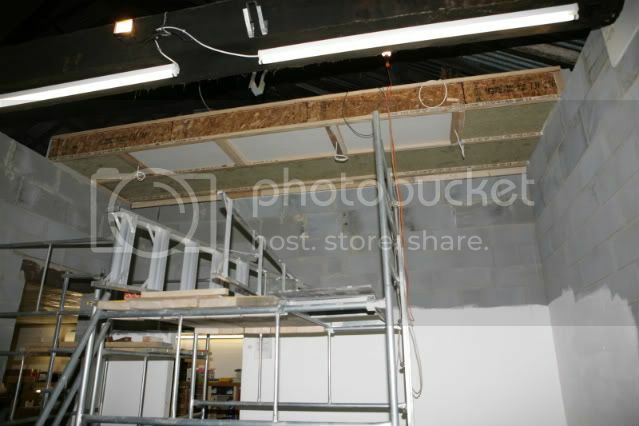 Room is 6m long, 5m wide, and as you've seen 4.1m high. 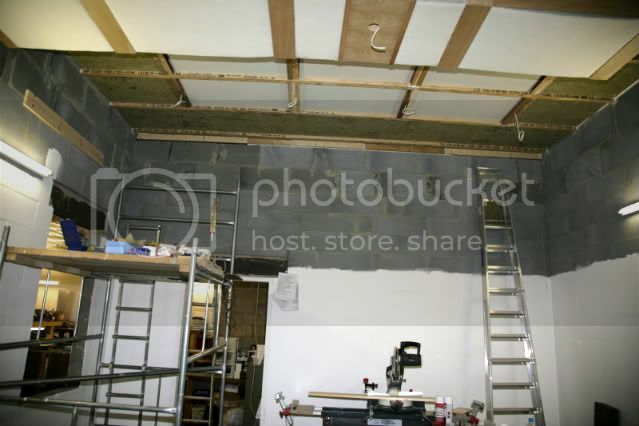 Front wall will be kept reflecting as you suggest in the faq etc, but some traps will be on there as we need to put up some 'logos' which will be printed on canvas, and then mounted onto a couple of traps. I'd use rigid fiberglass on the rear wall. If you can make it six inches thick that will be better. And a foot thick is better still if possible.